I can be a lazy HOTG researcher. Of course, since I only do it for my own amusement and to satisfy my curiosity, it’s not like I am actually slacking. Let’s just say that sometimes I don’t pursue leads; I let them pursue me. Take for example, Ms Margie Joseph. 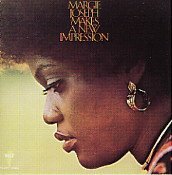 Back in November, 2004, early in the days of this blog, I posted a track from her initial Atlantic album, Margie Joseph, produced by Arif Mardin in 1973 with backing by some fine session players who my friend, Roy, calls the New York Funk Brothers. Just recently, I ran across a couple more of Margie’s Volt singles from 1971; and thought I’d share a side with you. 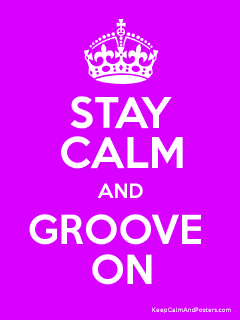 Produced by Freddy Briggs, a souful songwriter who composed our feature track, and recorded at Stax in Memphis with the Bar-Kays and “staff musicians”, as well as at Muscle Shoals Sound Studio with its great house rhythm section, Makes A New Impression has many complex and lushly orchestrated arrangements (such as her cover of “Stop In The Name of Love”, which was also a hit single). Just four tunes on the album are more straightforward soul with some touches of funk, including “Sweeter Tomorrow”. This driving track has heavy hitting drums (with some tricked out pedal work at the end), propulsive bass, several guitars picking, chopping and wailing, plus some horns for added heft. I am going to take a wild stab and guess that the more earthy tracks like this were done in Muscle Shoals, since the album notes don’t specify. Just a hunch. Be that as it may, I think the song is one of the best for her voice on the entire album. As I've stated before, my probably too generalized criticism of the production work on Margie Joseph’s numerous LPs is that the arrangements on many of the songs were too big and often too smooth; but that was what sold, I guess, as a number of those tunes charted. I much prefer the simpler, more gritty (less commercial?) songs she tackled with her powerful, resonant voice, even if she did sing the deep stuff quite well. But, I never claimed to have my finger on the erratic pulse of the music bidniz. That should be obvious. Margie's work is well worth discovering and exploring. You’ll be hearing more by her here, I’m sure. The three comments above were all spam. The management. Dan: Now you talkin. Yes. "Phase Two" is a great effort.Thank you for the nice mention,by the way, just as I was about to leave the business too.Personally I favor"I'm Fed Up" but this will do very nicely thank you. Finally. A comment that's not spam. Thanks to the Holy Hellhound man. "Fed Up" is another one of those good 'uns like I was talkin' about. Hey, don't jump ship just yet, man. Sleep deprivation has its moments. 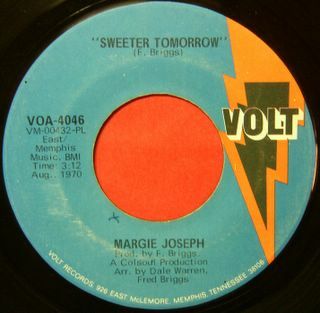 I have a 45 rpm vinyl copy of "What's Wrong Baby," by Margie joseph the B-Side to "your Sweet Lovin' (Single VOA-4037, April 1970). Does anyone know where I can find it on CD or MP3?